The objective of this tutorial is to expose its participants in the incredible immediacy, affordability and plethora of existing crowdsourcing services for the purpose of eliciting user requirements, evaluating prototypes, understanding context of use or generating new design ideas. The objective of this module is to expose its participants in the incredible immediacy, affordability and plethora of existing crowdsourcing services for the purpose of eliciting user requirements, evaluating prototypes, understanding context of use or generating new design ideas. Crowdsourcing has been used from the start of this century for a variety of uses. Previous uses include the design of clothing, creation of TV-ad concepts but even tackling complex corporate R&D problems such as the analysis of geological data! Beyond past uses there are currently several services with enormous potential for user and design research. The emergence of these crowdsourcing services open up considerable new possibilities for the collection of both quantitative and qualitative user data. The main reason for those possibilities is the immediacy and affordability of recruitment of a vast number of potential users. Possibilities can extend from traditional user requirements elicitation to gathering data about certain user contexts, to ideation (brainstorming with the crowd) to evaluation of prototypes even pitching and gathering funds (known as crowdfunding). Apart from affordability and immediacy a variety of media types and a global task force of various backgrounds can ensure both qualitative and quantitative data from a global user base. Imagine if you can post your design or user-related request in the morning, go have lunch and when come back to your desk get hundreds of results back from a plethora of users. Such a scenario has nowadays become a fact. This tutorial targets both academics and practitioners engaged in any stage of user research or trying to design innovative solutions while at the same time are interested in reducing costs and time when it comes to gathering useful insights from a global user-base. Dr. Vassilis Javed Khan is a senior lecturer and researcher at NHTV Breda University of Applied Sciences, in the Netherlands. 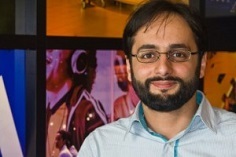 Javed holds a PhD from the Industrial Design department of Eindhoven University of Technology. He has already taught courses and presented on the use of crowdsourcing services for user research and design innovation in universities in the Netherlands. In the past he has worked in Philips Research, Vodafone R&D in the Netherlands as well as in the Computer Technology Institute in Greece.